In 1915 Justice Aaron McAlvay died suddenly, leaving a vacancy on the Michigan Supreme Court. 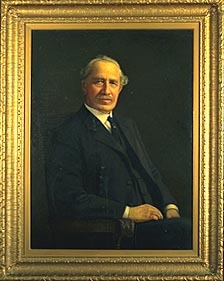 Governor Woodbridge Ferris (the only Democratic governor between 1893 and 1933) appointed Rollin Person to the spot a week later on July 16, 1915. Person, an attorney and former judge, was defeated in the 1916 general election; his term ended on December 31, 1916, and he was replaced by Justice Grant Fellows. While Justice Person’s time on the Court was brief, he has endured because of his daily habit of writing a diary. Entries include information about his family and friends, his work on the Court, the weather, and even the score of the UM vs. MAC (now MSU) football game. May history prevail again this Fall! The diary entries are part of the Society’s High School Lesson Plans and were studied by students in the Exploring Careers in the Law summer program this week. To learn more about Exploring Careers in the Law, including what they have planned for tomorrow, read the article in the Legal News. Had Person lived a century later, one can only imagine that he might have been writing a blog instead.